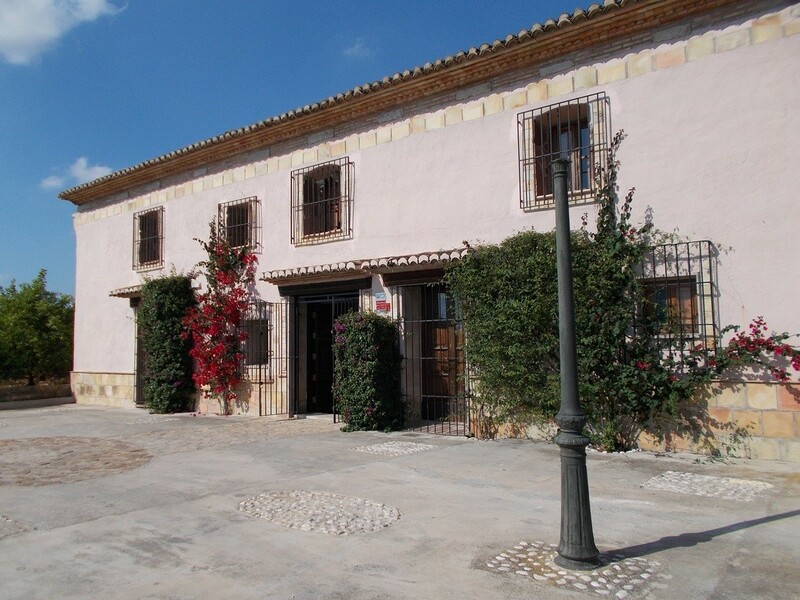 Welcome to our distinctive, fully restored farmhouse with swimming pool nestled in the heart of the orange groves just outside Rafelcofer. 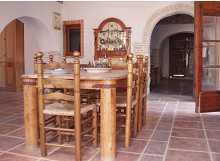 We can accommodate 10 people comfortably and if your group is larger, another villa lies close by. The house is just a three minute walk from the beautiful Spanish town of Rafelcofer and a five minute drive from the bustling towns of Oliva and Gandia. This luxury property has been tastefully restored, retaining many of the original features including exposed stonework, archways and wooden beams. The spacious ground floor consists of a fully fitted kitchen with large gas cooker, dishwasher and washing machine. There is a separate dining area just off the kitchen. On the ground floor are double and twin bedrooms with a shower room between. The lounge has a large TV, equipped with satellite and DVD player. 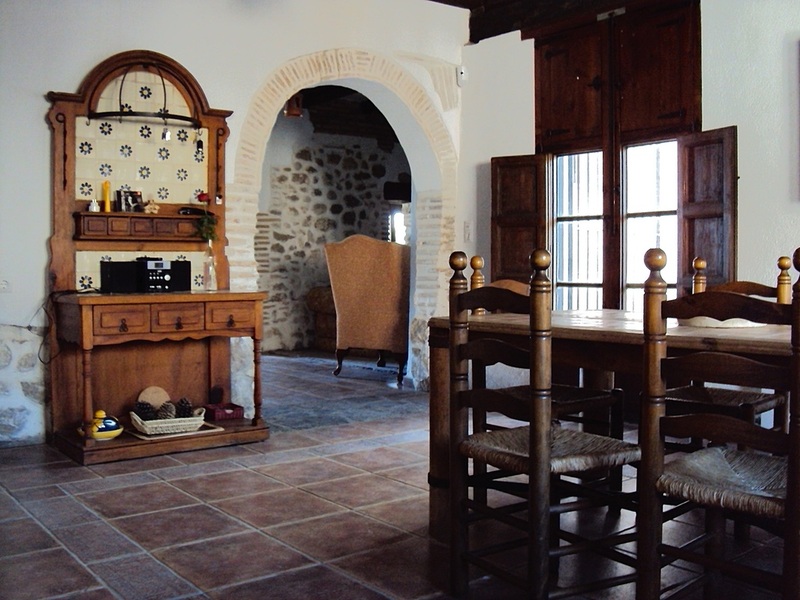 It also contains a wooden stove, which provides for a cosy atmosphere on cooler nights. Double doors lead out to a large courtyard with BBQ and seating area. The second courtyard, which leads to a large swimming pool and garden area, has four storage rooms including bicycle storage and work area. Bordering the swimming pool you will find our orange trees and you are welcome to sample the fruit when in season. Upstairs there are two double bedrooms, one of which is en-suite, and one twin room all of which contain fitted wardrobes. There is a full bathroom and large landing area. 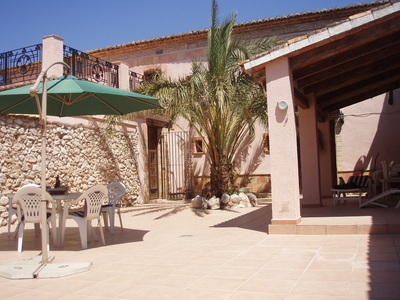 The front double bedroom leads out onto another large terrace area with views over the orange groves to the mountains. There is full oil fired central heating in the house and ample parking at the front. Additional photos of the house are available upon request. Thoroughly enjoyed my cycling last week, you provide an excellent facility in your rustic home with all conveniences making for a very comfortable stay. The quality of the bikes was way better than I expected and this was a big bonus in not having to drag a box through the airport. I really enjoyed myself on the weeks holiday. It was very unique getting our exceptionally fresh orange juice in the mornings from the trees. I found the local area fascinating being so divorced from the tourist trail. We visited a local pub and were accepted very easily.The sports centre was great, enjoyed our lunches there and we even got the loan of a football to sample the pitch. Wonderful..I loved the bikes .I would say my bike was perfect for me and the routes were unbelievably interesting and scenic.One could get very fit very quickly over there.